A smart technology which involves smuggling gold nanoparticles into brain cancer cells has proven highly effective in lab-based tests. A “Trojan horse” treatment for an aggressive form of brain cancer, which involves using tiny nanoparticles of gold to kill tumour cells, has been successfully tested by scientists. The ground-breaking technique could eventually be used to treat glioblastoma multiforme, which is the most common and aggressive brain tumour in adults, and notoriously difficult to treat. Many sufferers die within a few months of diagnosis, and just six in every 100 patients with the condition are alive after five years. 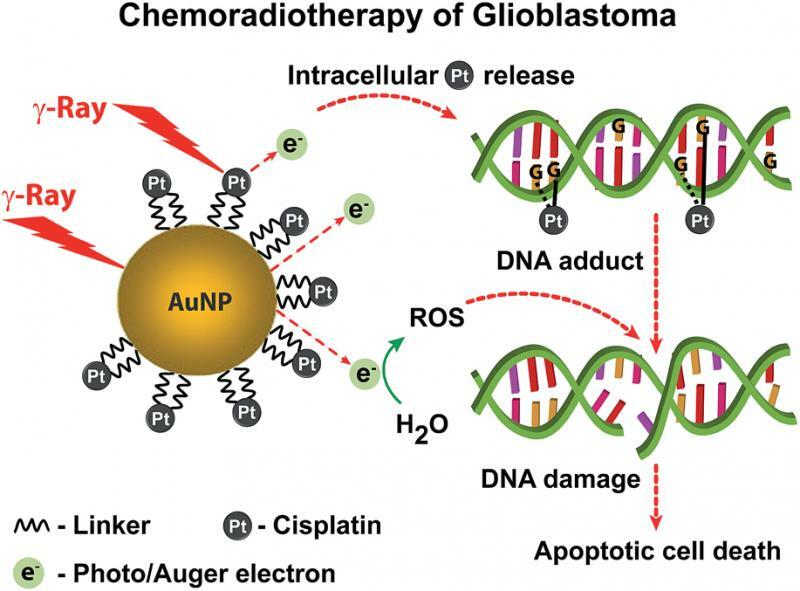 The research involved engineering nanostructures containing both gold and cisplatin, a conventional chemotherapy drug. These were released into tumour cells that had been taken from glioblastoma patients and grown in the lab. Once inside, these “nanospheres” were exposed to radiotherapy. This caused the gold to release electrons which damaged the cancer cell’s DNA and its overall structure, thereby enhancing the impact of the chemotherapy drug. The process was so effective that 20 days later, the cell culture showed no evidence of any revival, suggesting that the tumour cells had been destroyed. While further work needs to be done before the same technology can be used to treat people with glioblastoma, the results offer a highly promising foundation for future therapies. Importantly, the research was carried out on cell lines derived directly from glioblastoma patients, enabling the team to test the approach on evolving, drug-resistant tumours. The study was led by Mark Welland, Professor of Nanotechnology at the Department of Engineering and a Fellow of St John’s College, University of Cambridge, and Dr Colin Watts, a clinician scientist and honorary consultant neurosurgeon at the Department of Clinical Neurosciences. Their work is reported in the Royal Society of Chemistry journal, Nanoscale. To date, glioblastoma multiforme (GBM) has proven very resistant to treatments. One reason for this is that the tumour cells invade surrounding, healthy brain tissue, which makes the surgical removal of the tumour virtually impossible. Used on their own, chemotherapy drugs can cause a dip in the rate at which the tumour spreads. In many cases, however, this is temporary, as the cell population then recovers. In an effort to beat tumours more comprehensively, scientists have been researching ways in which gold nanoparticles might be used in treatments for some time. Gold is a benign material which in itself poses no threat to the patient, and the size and shape of the particles can be controlled very accurately. When exposed to radiotherapy, the particles emit a type of low energy electron, known as Auger electrons, capable of damaging the diseased cell’s DNA and other intracellular molecules. This low energy emission means that they only have an impact at short range, so they do not cause any serious damage to healthy cells that are nearby. In the new study, the researchers first wrapped gold nanoparticles inside a positively charged polymer, polyethylenimine. This interacted with proteins on the cell surface called proteoglycans which led to the nanoparticles being ingested by the cell. Once there, it was possible to excite it using standard radiotherapy, which many GBM patients undergo as a matter of course. This released the electrons to attack the cell DNA. While gold nanospheres, without any accompanying drug, were found to cause significant cell damage, treatment-resistant cell populations did eventually recover several days after the radiotherapy. As a result, the researchers then engineered a second nanostructure which was suffused with cisplatin. The chemotherapeutic effect of cisplatin combined with the radiosensitizing effect of gold nanoparticles resulted in enhanced synergy enabling a more effective cellular damage. Subsequent tests revealed that the treatment had reduced the visible cell population by a factor of 100 thousand, compared with an untreated cell culture, within the space of just 20 days. No population renewal was detected. The researchers believe that similar models could eventually be used to treat other types of challenging cancers. First, however, the method itself needs to be turned into an applicable treatment for GBM patients. This process, which will be the focus of much of the group’s forthcoming research, will necessarily involve extensive trials. Further work needs to be done, too, in determining how best to deliver the treatment and in other areas, such as modifying the size and surface chemistry of the nanomedicine so that the body can accommodate it safely.